The summer of 2008 was to be the first to welcome the DCI World Championships into the brand new Lucas Oil Stadium in Indianapolis. That was, until it was announced the stadium wouldn't be ready in time, resulting in the event being moved to Memorial Stadium at Indiana University. Finishing in 13th through 16th place were the Crossmen, Colts, Spirit and Troopers, respectively. Each earlier seemed to have had a chance to make it into the Finals competition and each, in fact, had bested the 12th place Madison Scouts earlier in the season. 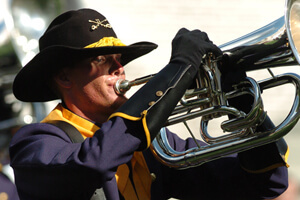 It was a banner year for the 16th place Troopers, as the corps advanced into the Semifinals for the first time since 1995. This was at a time when only the top 17 corps performed at the Friday-night competition of World Championships Week. Just two years removed from not even being on the field for one season, Troopers bounced back into 20th place in 2007, two years prior to making it back into the Finals for the first time in more than 20 years. In between those two banner years was another banner season, the corps' 50th anniversary, celebrated with a show titled, "The Iron Horse Express." The show was full of musical and visual references to the historic opening of the American western frontier via the development of railroads through vast plains of wilderness. The corps conveyed the sense of wonder people of that era had while watching the trains chug on by, imagining traveling in comfort and speed to destinations far away. The Transcontinental Railroad, which created the possibility of rail travel between the West and East Coasts, passed through hundreds of miles of the southern portion of the corps' home state of Wyoming. The first coast-to-coast trains started running in 1876, about seven years after the famed "Golden Spike" was driven into the ground in Utah that allowed rail travel between Missouri and Sacramento, some 14 years prior to Wyoming becoming a state. Throughout the show, the color guard members, wearing metallic costumes reminiscent of the cladding on old steam engines and emblazoned with a large orange train headlight, performed with flags suggesting the colors of the terrain the trains would pass through while traversing the Old West. The show began with a brief and soft hint of "Ghost Riders in the Sky" played to the backfield, and then the corps went full throttle into the first movement of "Ghost Train Triptych," written by Eric Whitacre in 1993. Whitacre is well known to drum corps fans, but many may not realize most of his selections heard on the field originated as choral works. "Ghost Train" was originally conceived as being about a supernatural train of legend moving through the Old West, and Whitacre planned to score it for 100 trombonists and percussion. Instead, he wrote the first movement for wind ensemble, and its success inspired him to add two more movements. Troopers utilized the first and original movement, "Ghost Train," pumping their instruments up in the air as if the cylinders on a steam engine's giant wheels. In the front ensemble percussion, an air bellows-operated train whistle announced the train was moving down the tracks into Sean O'Loughlin's "Canyon of Heroes," a valiant piece originally written in 2002 for brass quintet and symphonic band to honor the heroes of the September 11, 2001 terrorist tragedies. The opener ended with the train sputtering into the next station, coming to a stop with the end of Whitacre's first movement. "Sasparilla" was composer John Mackey's first fully-originally work for wind ensemble, written in 2005. It followed the success of his prize-winning "Redline Tango," a band work originally written for orchestra. The playful piece was named for a type of liquor sold in the Old West and conveys mental images of being in and around saloons, although Mackey never claimed there were any specific musical images. The corps started their rendition with a trumpet playing the solo originally written for accordion in front of a saloon door. During the work, the corps members formed the outline of a steam engine with a cowcatcher on the front, moved down the tracks a bit, stopped to raise their arms to blow the whistle and let loose two toots. Stopping at a town with a saloon, a good time was had by all and some of the passengers even picked up some new friends in town. Richard Saucedo, former arranger for the Cavaliers, wrote "Song of the Gandy Dancers" in 2007 as a tribute to the railroad workers of a past era. A gandy dancer was a railroad worker who laid and maintained railroad tracks before such work was automated by machines. The piece captured the toil of the workers and the songs they sang to help pass each day of tremendous physical labor. Stan Jones, a songwriter who composed songs for a number of Hollywood Westerns and also acted in a few, wrote the corps' "go-to" tune of "(Ghost) Riders in the Sky." Jones wrote the song in 1948 when he was working as a park ranger in Death Valley. It was there that he was assigned as a technical advisor to famed Hollywood director John Ford, who made introductions for Jones in Hollywood. The song, originally recorded by Burl Ives, was made more famous when Gene Autry sung it in the 1949 film, "Riders in the Sky," directed by John English. It is said that the melody is based on "When Johnny Comes Marching Home," which has also been performed multiple times by the Troopers. A very short backfield snippet from "The Cowboys" by John Williams led into the corps' famed exploding circle "sunburst" maneuver. Members picked up imaginary sledgehammers and pounded the railroad spikes into the rails. A hint of "I've Been Working on the Railroad" led into a final push, with a color guard member placing the symbolic Golden Spike on the rail of the 50-yard line as two brass members pounded it in with their horns. As the spike went into the ground, the guard member stepped on it so that the bottom of her foot caused the bottom of the stake to collapse out of sight, making it appear as if the spike really did sink into the rail. It was an action symbolic of when the east finally met the west at the beginning of one of America's greatest journeys. 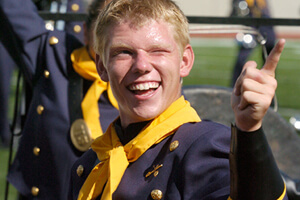 For this week only, you can save on the DVD that contains this complete Troopers performance, along with all corps from Volume II of the 2008 DCI World Championship DVD set. Buy the 2008 Volume II DCI World Championship DVD (Available this week only for 20% off. Regular price: $35.95.) DVD offer ends Monday, October 28, at 8:30 a.m. ET.